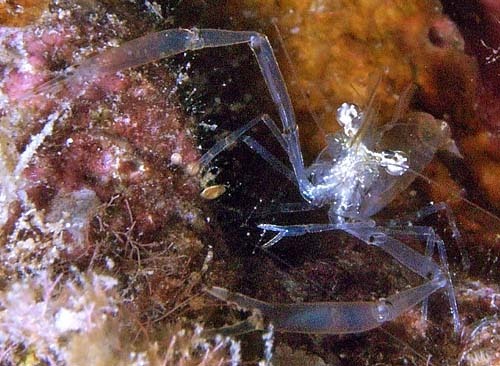 A photo of this shrimp appears in Hawaii's Sea Creatures on p. 235. In earlier printings it was incorrectly identified as Lysmata ternatensis. 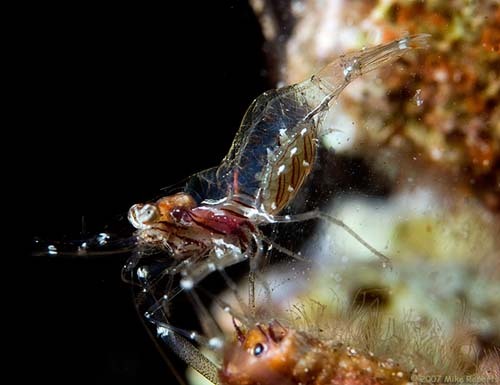 Recent photos of the real L. ternatensis show a striped shrimp, not a spotted one. Obviously, then, this is something else. I sent the photos to Dr. Sammy de Grave of Oxford University, who thinks that it is probably a species originally described by zoologist Mary Jane Rathbun in 1906 from 4 specimens found under a tugboat in Honolulu and one specimen dredged off Kauai. Rathbun named her shrimp Hippolysmata acicula. Unfortunately, as was typical in those days, she did not note the color of the live animal. In 1997 Rathbun's specimens were examined by zoologist Fenner Chace of the Smithsonian, who declared that H. acicula was the same as Lysmata ternatensis, a species from Indonesia that had been described and named several years earlier, in 1902. However, the museum specimens Chace examined were bleached and devoid of color. Now that photos of the living animals are available, it's clear that the species pictured here and in my book is not ternatensis. However, to prove that these Hawaiian ones are indeed Rathbun's acicula (or possibly something else), several need to be collected, photographed, and examined. Unfortunately, they are very rarely seen. If you find these shrimps anywhere, please let me know. Specimens needed! (Thanks to Dennis McCrea and Debra Newbery for finding this pair and showing them to me! Debra has taken some terrific video of these shrimp interacting with a banded coral shrimp, Stenopus hispidus, and an unidentified portunid crab. Update: In December 2010 Dennis McCrea found and collected two of these rare animals and sent them to Dr. de Grave, who is in the process of determing whether they are Rathbun's acicula or a new species. Meanwhile, I have made bold and changed the name in my book to L. acicula. Your penaeid photo does not show much as the shrimp is burying in sand. I am sorry that I can not identify it positively, though it is likely a Metapenaeus judging from coloration (there are many species in Metapenaeus and their coloration are very similar). But juvenile of Penaeus s.l. and some Metapenaeopsis sometimes also with this green body and dotted coloration. The Bishop Museum records only one species in the genus Metapenaeus as occurring in Hawaii: Metapenaeus affinis. So that is one possibility. I was impressed by the blue-green coloration, as sand-dwelling shrimps of this sort that I have seen before have all been reddish. 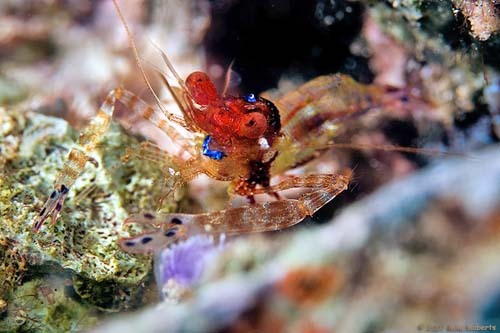 However, shrimps that are reddish at night are sometimes bluish or greenish by day, and Paul took this photo in the late morning. 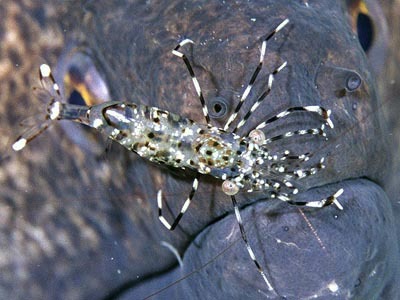 A photo of this shrimp appears in Hawaii's Sea Creatures on p. 233, photographed out of its natural habitat but clearly showing the two dark "eyespots" on the upper rear of its carapace. The photos above show the shrimp as it appears in its natural habitat, with eyespots out of sight or barely visible (as on the shrimp in the bottom photo). 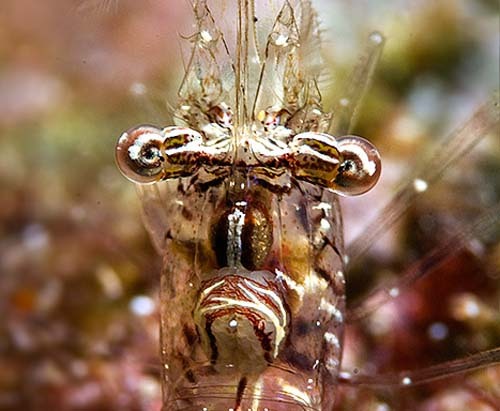 According to Japanese shrimp expert, Dr. Junji Okuno, an almost identical Saron shrimp that lacks false eyespots has also been identified as Saron neglectus. That shrimp is widespread in the Indo-Pacific, but absent from Hawaii. If the "eyeless" shrimp turns out to be the true neglectus, then the species pictured above could be un-named. The uncertainty is probably due to the original neglectus having been described from colorless museum specimens. Dr. Okuno has compared the two and has found no significant differences except for the color pattern. L. pymoeus lives on sea grasses, Halimeda, and perhaps other types of algae throughout the Indo-Pacific. It varies in color from brown to green, often with lighter spots and markings and grows to about 3/8 in.. The large rostrum can vary somewhat in shape. 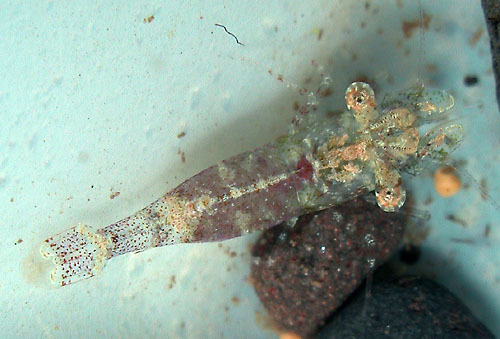 As far as I know, this species has not been officially recorded from Hawai`i, but in 2011 Cory Pittman sent specimens from Maui of what appears to be the same shrimp to Alain Crosnier in Paris, who identified them. Ralph Turre took the photos off Sugar Beach, Maui, at night. Depth 20-25 ft. I found several of these in a head of Cauliflower Coral (Pocillopora meandrina) at Ho`okena, Hawai`i at a depth of about 20 ft. They were difficult to photograph as they kept moving out of sight around the coral, and this is the best I could do. I had never seen the species before, and have not found it since. The shrimp has a wide Indo-Pacific distribution, from Africa to Easter Island, and always associates with branching corals (Pocillopora, Seriatopora, Stylophora, rarely Acropora). Crazy name--why "Easter"?? Who knows, but that's the meaning of paschalis, the Latin species name. Likely the shrimp was discovered or named on Easter Sunday. It is only about 1/4 in. long, thus rarely noticed. It belongs to the genus Thor, which has only five known species. Thor paschalis is widespread in warm seas throughout the Indo-Pacific but little else seems to be known about it. The animal in the top photo was collected by Cory Pittman off Maui and sent to Dr. Alain Crosnier in Paris for identification, so the ID is sound. The bottom photo was taken by Scott Rettig at South Point, Hawai`i. I am guessing that the two are the same species, but physical examination of a specimen might be necessary to confirm this. Exocliminella maldivensis Duris & Bruce, 1995.